Hair holds great importance for beauty and has been called our “crowning glory.” Society has placed a great deal of cultural importance on hair and hairstyles. Unfortunately, many conditions including disease and improper hair care result in excessive hair loss. Those who notice excessive hair loss after brushing their hair, or after a shower, or hair strands on pillow should consult a good dermatologist. A correct and timely diagnosis will result in the reversal of the problem. Losing Hair, thinning and going bald has been a problem for men and women since the dawn of time. Baldness is typically something only adults need to worry about but in rare cases, we see that teens lose their hair as well – and it may be a sign that something’s amiss. Hair Loss during adolescence can mean the person is unwell and weak or maybe just not eating right. Some medications or medical treatments also cause people to lose their hair – e.g. chemotherapy treatment for cancer. On the other hand, people can lose their hair if they wear a hairstyle that pulls on their hair roots for a long time, such as braids. Hair Loss can be stressful because appearance really matters, as society demand it, but helpful facts are that hair loss that occur during teen years is often temporary because at any one time, about 10 percent of the hair on your scalp is in resting phase and after 3 to 4 months, this resting hair falls out and new hair starts to grow in its place. This growing phase lasts for 3 to 7 years. Each hair grows approximately 1 and half centimeter per month during this phase. About 90 percent of the hair is growing at any one time on your scalp and this is the Normal Cycle of Hair Growth and Loss. More often than not, the hair usually grows back, once the problem that causes it is corrected. Here, we discuss basics of hair. Everyone should know that protein is necessary for hair and helps to grow new hair. Yogurt, eggs and pulses are useful proteins, but Keratin is the single most protein that is helpful in producing our hair, which is made up of the protein Keratin. A single hair consists of a hair shaft, a root below the skin, and a follicle, from which the hair shaft grows. At the lower end of the follicle is the hair bulb, where the hair’s color melanin, or pigment is produced. Most people lose about 60 to 100 strands of hair a day but usually these are replaced – they grow back in the same follicle on your head. This type of hair loss and amount of hair loss is totally normal and not a cause for concern but if you’re losing much more than that, something could be wrong. 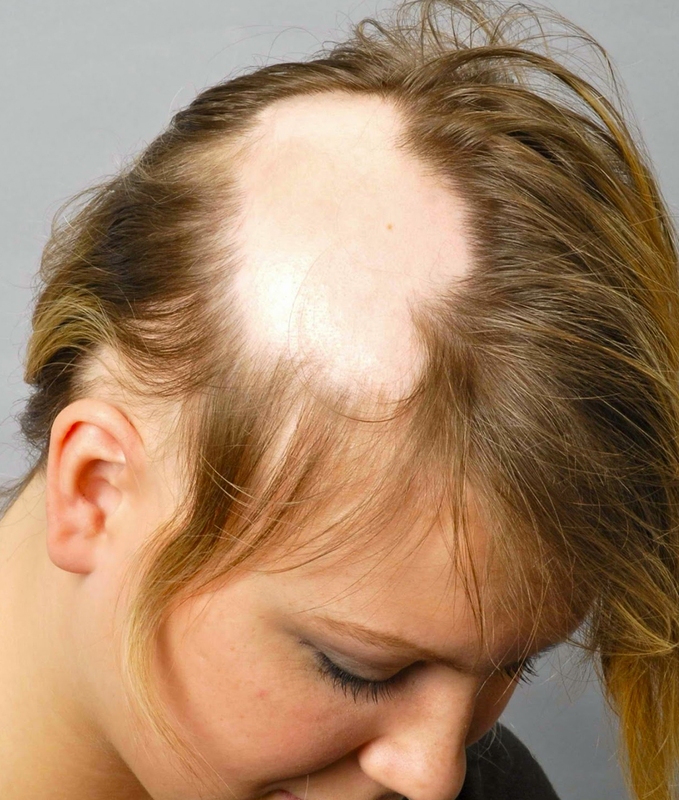 The medical term for patchy or circular bald spots on the scalp area is alopecia (pronounced: ah-luh-pee-shia). If you have unusual hair loss and don’t know what’s causing it, a visit to the dermatologist might be a good idea. A doctor can determine reasons for falling hair and suggest a treatment that will correct the underlying problem, if necessary. Medical conditions and illness is one reason for hair loss. Disease such as uncontrolled diabetes or thyroid can interfere with hair production and cause hair loss. Medications and drugs is another reason as some medications that have hair loss as a side effect. Medications related to chemotherapy drugs for cancer are probably the most well-known that cause hair loss. Hair Treatments and styling are another cause of hair loss. Having your hair chemically treated, bleached, colored, premed or straightened can cause damage that may make the hair break off or fall out temporarily. 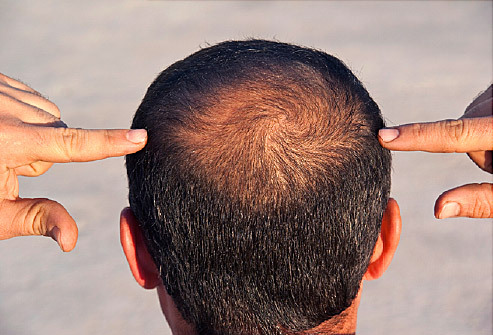 Poor Nutrition or poor eating can contribute to hair loss. This is the reason some people with eating disorders like bulimia and anorexia lose their hair as the body isn’t getting enough vitamins, protein, and minerals to sustain hair growth. Change in Lifestyle is another cause where major events can alter the hair’s growth cycle temporarily. For example, having surgery, delivering a baby, or getting anesthesia can temporarily stop the hair growth cycle but this type of hair loss usually corrects itself. Whatever the cause of hair loss, only one product has reliably provided relief by initially stopping hair loss and eventually re-growing lost hair over consistent use – Saini Herbal Scalp & Hair Conditioner. A totally natural, ayurvedic topical solution with natural DHT blockers and inhibitors with zero side effects.